+SPD: A Speed Asset is Sakura’s most versatile choice of IVs, providing a substantial boost to her overall performance regardless of the build she is running by enhancing her ability to perform and deny follow-up attacks. +ATK: An Attack Asset is also quite good as it allows her to increase her raw damage output as well as how much damage she can heal. RES: At a base value of 30, Sakura has a respectable amount of Resistance and can perform as a rather reliable user of Ploys, adding to her overall utility. Accordingly, it is recommended to leave her Resistance untouched. -HP / DEF: Although Sakura’s physical bulk may be on the higher end of the spectrum as far as healers go, a Flaw to either stat can still be considered ideal to avoid having to take a Flaw in any other stat. Furthermore, her access to skills such as Dazzling Staff renders the cut to her physical bulk negligible as she should rarely (if ever) be taking a hit. This build aims to capitalize on Sakura’s exceptional versatility as an offensive support unit -- a direct result of her overtly balanced statline -- and allows her to debilitate opposing teams with ease while simultaneously being able to provide healing support. A Speed Asset will generally be her preferred choice of IVs to augment both her overall damage output and survivability, but an Attack Asset can also be taken to strengthen the power of her individual hits as well as increase the amount of damage she can heal. For her weapon, the Pain staff is a fantastic option that enables Sakura to deal significant amounts of chip damage to multiple foes at once -- when utilized in tandem with Savage Blow in both her C and seal slot, Sakura will be capable of inflicting up to 24 points of chip damage to her opponent as well as any additional surrounding foes, greatly diminishing their health. In exchange for losing out on ten points of chip damage, the Gravity staff can also be considered to cripple the opposing team’s mobility instead. The refine taken on Sakura’s weapon should ultimately correlate with the availability of either Dazzling or Wrathful Staff for her chosen B slot skill -- if making use of Dazzling Staff as her B slot skill, take a Wrathful Staff-refine and vice versa. Sakura’s native Physic+ is an excellent choice for her healing skill, granting her additional range to aid in her supportive capabilities. Recover+ can also be considered for its much more potent and reliable healing potential, but comes at the cost of losing out on the extended range that Physic+ provides. For her Special, Windfire Balm+ is an exceedingly potent option and grants all of her allies with an impressive +6/+6 Atk/Spd buff upon activation. However, should one be making use of allies who already carry Attack- or Speed-buffing skills such as Hone Atk, Windfire Balm+ can be redundant, Heavenly Light is a good alternative option to provide all of her allies with a teamwide heal. On a budget, her native Still-Water Balm can be used but depending on the rest of her team composition, the Resistance buff it provides may be effectively useless. Atk/Spd Solo is Sakura’s ideal choice for an A slot as it offers her an impressive +6/+6 boost to both of her offensive stats, only requiring her to have no adjacent allies in order to have its powerful effect active. Atk/Spd Push is another notable option that grants Sakura a similar boost to her offensive potential, but requires to be utilized in combination with the Live to Serve seal as the skill's powerful effect is only active when she is at 100% HP. Should they be unavailable, Speed +3 and Attack +3 are suitable budget alternatives that can be taken to strengthen one of her offensive stats. In contrast to the first set, this build aims to make Sakura take a far more support-inclined role, focusing on her ability to act as both a competent debuffer and healer concurrently. A Speed Asset is ideal to enhance her survivability by lessening her chances of being doubled, although a Resistance Asset can also be a suitable choice of IVs to strengthen her probability of activating her Ploys against opposing foes. Sakura’s choice of weapon for this build is largely up to personal preference and can be interchangeable depending on what best suits her teammates’ needs. The Gravity and Pain staves are fantastic choices once again, allowing her to cripple her foes’ mobility and health respectively. Albeit more costly in terms of resources than the aforementioned options, Witchy Wand+ can be extremely potent under the proper circumstances and enables Sakura to effectively control the course of the battle by negating her opponent's’ Special activations. Regardless of her chosen weapon, however, it is recommended to take a Dazzling Staff-refine to let Sakura safely apply her staff’s effect without worry of being killed on retaliation by a foe. Moving on to her choice of healing skill, Recover+ as well as her native Physic+ are both suitable options once more, but similar to her weapon, the choice between which to use is ultimately up to personal preference. Windfire Balm+, Heavenly Light, and on a budget, her native Still-Water Balm are all exceptional Specials to utilize to bolster Sakura’s supportive capabilities, all of which provide strong team-supportive effects upon activation. As for her A slot skill, Spd Res 2 is a strong candidate that simultaneously improves her survivability and ability to use Ploys, though Attack/Res 2 is also an excellent option to increase the amount of damage she can heal. Alternatively, one can take Fortress Def/Res to dramatically strengthen her bulk as well as her Ploying capabilities, though it does detract from her healing slightly with its additional effect of -2 Attack. If none of the aforementioned are available, then Speed +3, Attack +3, and Resistance +3 are all solid budgetary replacements. Since this build revolves more on Sakura’s supportive capabilities, she can forego the need to run Wrathful Staff altogether, freeing up her B slot to other, powerful alternatives. One particular standout is Wings of Mercy, a spectacular support skill that allows Sakura to warp next to weakened allies who can then benefit from her healing abilities. Live to Serve can also be considered to prolong Sakura’s stay on any given map by letting her effectively heal herself of any potential damage inflicted upon her. Sakura’s base Resistance of 30 allows her to be a pretty reliable user of Ploys, which she can use in both her C and seal slot to provide further team support. Although a combination of Atk and Spd Ploy will generally provide the most debilitating and versatile, depending on her team composition, Def or Res Ploy may be preferred, rendering the decision of which combination of Ploys to use a matter of personal preference as well. 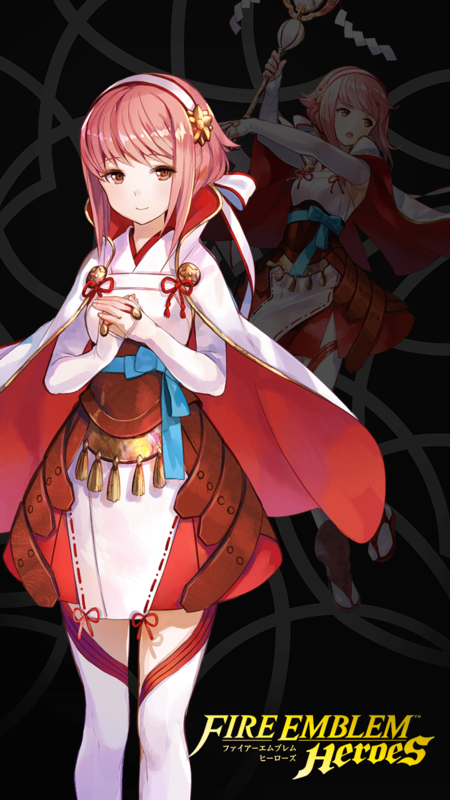 The shyest and youngest of the Hoshidan siblings, Sakura meekly makes her way into the fray as an infantry healer. By merit of being a healer alone, she possesses distinct advantages over much of the cast, most notable of which being her supportive capabilities as well as her access to the coveted Dazzling + Wrathful Staff combination. Statwise, she is most aptly described as a jack-of-all-trades, toting workable Speed and Resistance stats, a somewhat low Attack stat, and surprisingly decent physical bulk (for a healer) -- to put it simply, in terms of stats, she’s fairly balanced. As a result, she’s one of the more versatile healers currently available in the 3-4* pool as her statline allows her to run a variety of different builds quite effectively. However, her balanced stat spread ultimately acts as a double-edged sword -- although it does allow her to be rather versatile, it does limit her ability to specialize as much as other, more offensively or defensively oriented staff users. Furthermore, her middling Attack stat, while not outright terrible given her status as a healer, also limits her offensive potential as well as the amount of damage she can heal. Nonetheless, despite these weaknesses, Sakura’s effectiveness cannot be understated, proving to be a great asset to any number of teams with her potent healing and support capabilities. Like all other healers, Sakura has access to the coveted Dazzling + Wrathful Staff combination, which lets her safely attack opponents without fear of being killed on retaliation and apply her weapon’s effect while also circumventing the damage penalty applied to staff units. Thanks to Sakura’s good base Resistance stat, she can reliably use Ploys to enhance her allies’ overall performance and further solidify her supportive capabilities. As a result of Sakura’s overall balanced statline, she can run any number of builds quite efficiently, allowing her to easily fit into a variety of team compositions with ease. This is only further emphasized by her access to a wide assortment of different support weapons, enabling her role to fluctuate depending on what is needed of her and the weapon she is wielding. Sitting at a neutral base value of 28, Sakura’s base Attack stat is lacking, hindering both her offensive and supportive capabilities. Sakura can struggle to find a niche for herself in comparison to some of her competition, as other healers can easily outperform her thanks to their far more optimized statlines and in some instances, superior mobility. Units who Rely on HP Thresholds: Units such as Brave Ephraim, Shiro, Chrom, Nowi, and Myrrh who are reliant upon their ability to consistently stay above the HP threshold of skills such as Quick Riposte and Special Fighter to function properly make for great choices of allies, benefiting greatly from her healing capabilities. Offensive Sweepers: Offensive sweepers such as Cherche, Raven, Reinhardt, Karla, and Summer Innes pair extremely well with Sakura when utilizing Pain+ and/or Savage Blow, as they can fully make use of her support and promptly take down their now-weakened opponents. Refreshers: Refreshers such as Bridal Ninian, Hoshidan Summer Xander, Olivia, Performing Azura, and Performing Inigo are great choices for allies and can establish a mutually beneficial relationship with Sakura -- they provide the young priestess with additional flexibility in the Player Phase, who in turn, can prolong their stay on the map with her healing support. Strong Physical Hitters: Despite Sakura’s physical bulk being slightly above average as far as healers go, strong physical hitters such as Ephraim, Tana, Winter Chrom, Reinhardt (WT), and Halloween Jakob can still easily tear through her defenses and take her down. High Resistance Tanks: Units with high Resistance stats such as Deirdre, Flora, Halloween Henry, Julia, and Micaiah can take the brunt of Sakura’s attacks, though such units should still take caution when facing off against Sakuras wielding Pain+ and/or Savage Blow as chip damage is unavoidable. Raven Tome Mages: Thanks to their distinct advantage against colorless units such as Sakura, Raven tome mages like Cecilia, Lyon, Sophia, Robin (M), and Robin (F) work as suitable counters against her. This is for users that want to have a great balanced healer. The good thing about a jack of all trades is that they’re very flexible and can work well with most of what you can give them. Sakura is a reasonable example of what I’m talking about. Before I begin explaining this set up, you should know that the reason this skill set worked very well for me is because I merged Sakura a lot, so don’t have any extreme hopes that this will be awesome. I just thought of this and felt proud of it, so here I am. If you decide to use this skill set, I would recommend having a +Def/-HP Sakura. I’m sure other IVs could work, but this is particularly meant to buff up her defense, considering that she’s slightly frail. If you decide to merge her, I would focus on her durability, but also a little bit of her Atk/Spd, so she can fight back as well. You could try doing half and half as I’m sure that would be good. It’s up to you and how buffed up you want her to be. I chose her attack to be Slow+. I had to think hard on this decision because I was considering the Fear+ (Wrathful Staff) skill that she has. However, I chose this skill instead because it can allow her to cancel counter attacks. You can use other stave skills as well and they’ll work usefully in their own ways. I couldn’t find any useful speed skills that weren’t nearly as effective as Slow+, which is why I focused on that. If you choose to use her primary tool, it will do well with bringing attack stats down on foes and you don’t have to worry about not having Wrathful Staff; also it’s cheaper, but I never really care about that. The only thing you’ll need to worry about if you decide to use something different is finding an effective Spd skill. Her support is Physic+. This is my personal favorite healing skill and this will explain why you need good Atk. The higher your healer’s attack is, the better their healing performance will end up. You can choose to focus more on Sakura’s attack because that’s a good idea, but I wanted to balance it out. A healer with a good Atk that uses Physic+ is a really good supporting unit and might even be the best in the game in terms of healing capability. The special is Imbue. The main reason why I decided to use this is because it’s simple to use and it increases the HP that Sakura gives. This was the kind of effect I was hunting for, but the specials I saw either increased particular stat categories or healed your entire team like Heavenly Light. Of course you can go for those approaches and that would very much help. It all comes down to what you prefer. Her A Slot is Fort. Defense/Resistance. Before I talk about this defensive skill, I really have to thank Kliff and Nintendo for giving us this skill because it’s one of my favorites. You get permanent +6 Def/Res for a very low cost of -2 Atk. It doesn’t come cheap in terms of orbs or SP, but it really helps to get a units defenses together. This is the main skill that I used for her durability change. It works really well on Kliff, but it works even better on a unit with middling durability. Thanks to this, I got Sakura’s defense and resistance up to 40 and over. I strongly recommend that you use this skill, but it’s up to you. Her B Slot is Wrathful Staff. I felt obligated to waste my B slot with this skill until I resolved her speed and attack problem. Thanks to this skill, you can forget all about the disadvantages of giving her the Slow+ staff. However, if you choose to use that spot for something else, that also works. I mainly use this skill to polish her fighting performance. So for her C slot, my main focus was finding ways to increase her Atk to better her fighting performance and healing performance. I had the hardest time with this slot because there were very few attack skills that I was interested in. I finally came to a decision of using Odd Atk Wave 3. This skill is great for support and strengthening her attack power. With a skill like this, she can go over 50 attack, which to me is better than average. Sakura can heal better with this skill as well as fight better. If you’re having her in a particular team, you could also find ways to use supporting Atk skills on other units to better Sakura’s performance, though my Sakura is meant to keep her stats without the support of other units, so she can go into any teams and not have to be negatively impacted by it. I typically like units that can heal themselves such as Ike and his Aether for example. He only has to rely on his own skill to keep his HP in check. This is why I gave Sakura the Live to Serve skill. She doesn’t have another healer supporter unless you like having two stave users in your team. If she can get from giving, that’s pretty effective if she’s ever put in a dire situation where she needs more HP. This does have it’s own problems though, considering that she’s going to need to rely on units getting hurt to support herself. Even so, it’s the best I could come up with in terms of self healing factors. You could use renewal, yet then you’ll have to worry about Wrathful Staff unless you don’t mind going without it that is. I know that my set is not perfect and further down the line, better skills will be used for her, but I hope this skill set helps at the very least. Martyr+: Use allies to also restore own HP. Miracle: Sakura is not allowed to die. Close Counter: For attacking all through enemy phase. The fact that melee units tend to have lower resistance helps keep Sakura healthy. Quick Riposte: Pairs well with close counter and absorb. Sakura gets to counter twice and stays in QR range thanks to Absorb. Atk Ploy 3: Damage mitigation when she's surrounded. Close Def 3: More damage mitigation. with her Defense boon and decent Speed she can get her defensive stats into 35/37 (Fear Debuff included).with a close/distant defense with your choice she turns into 41/43 defensive stats. Built for Tempest Trials. Usual teammates are Ike, Nino, and Ephraim. When I have an extra 20K feathers to burn and no one else to spend them on, I'll upgrade to Life to Serve 3. 5 star +2, Fortress Res 3 seal, Tank build that allows Sakura to use the fortress skills while not worrying about the loss of atk because of her weapon and savage blow. If they ever add a fortress def seal then that could be used as the seal and close counter could be used as the A skill so she can deal more chip damage even on enemy phase from melee attackers. Restricted to units that use a Staff. FearAfter combat, inflicts Atk-6 on targeted foe through its next action. Fear+After combat, if unit attacked, inflicts Atk-7 on target and foes within 2 spaces of target through their next actions. PhysicRestores 8 HP. Rng 2. ImbueWhen healing an ally with a staff, restores an additional 10 HP to target ally. Still-Water BalmWhen healing an ally with a staff, grants Res+4 to all allies for 1 turn. Fortify Def 1Grants adjacent allies Def+2 through their next actions at the start of each turn. Fortify Def 2Grants adjacent allies Def+3 through their next actions at the start of each turn. Fortify Def 3Grants adjacent allies Def+4 through their next actions at the start of each turn.